I started my decorating early this year – I usually wait till Friday after Thanksgiving but this year I started earlier in the week this year. 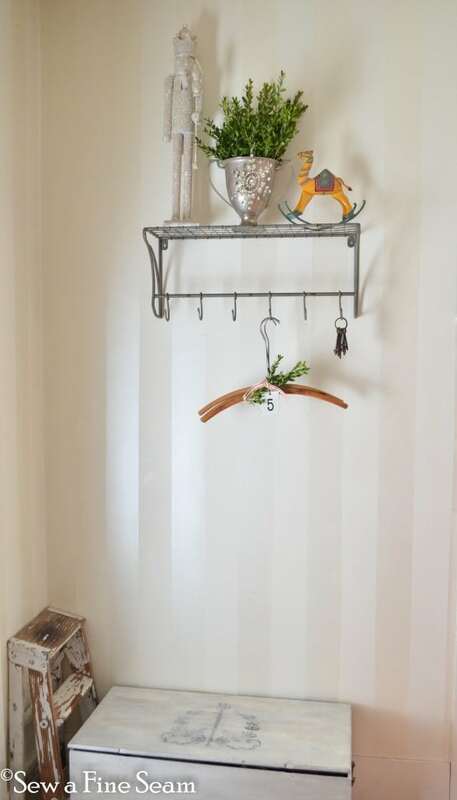 I had a couple other houses to decorate and wanted to get a head start on mine so I could decide what I was using in my own home and what I could take to use elsewhere. 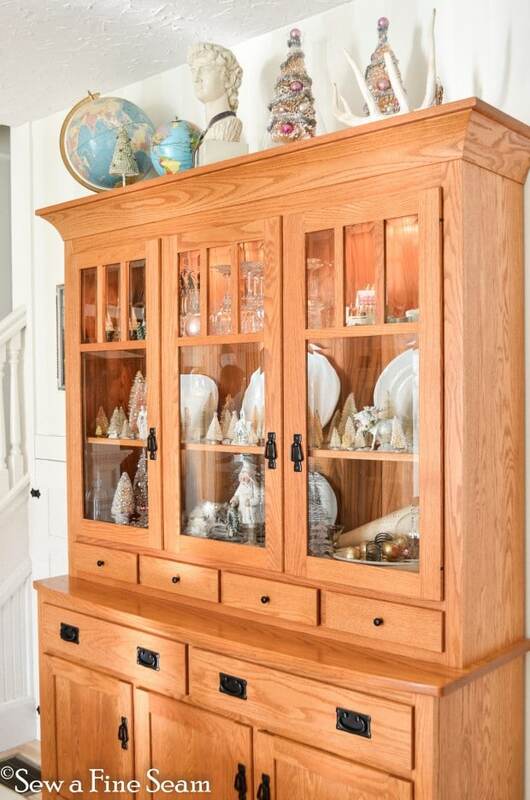 I never seem to start my decorating the same place – this year I started with my china cupboard and I love how it turned out. The only thing that would make it better is if it were already painted white!! 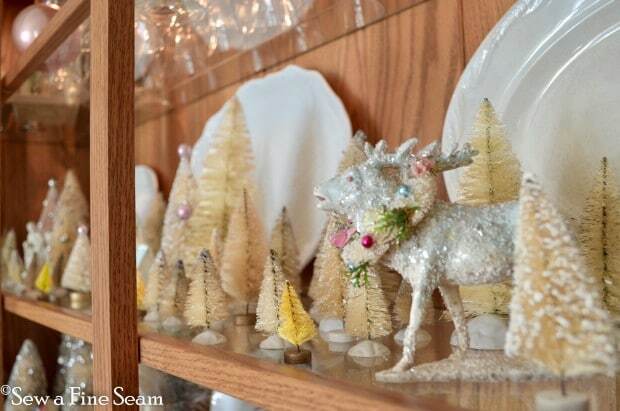 I bleached a bunch of bottle brush trees this year and put them all on one shelf of the cupboard and mixed in a few other trees and some favorite little things. This moose is one of my very favorite things. I’ve had it for years and he moves around to a new spot each year. Sometimes he’s the focal point of a vignette and others he graces a larger scene like this one. I think he is really enjoying his forest home this year. 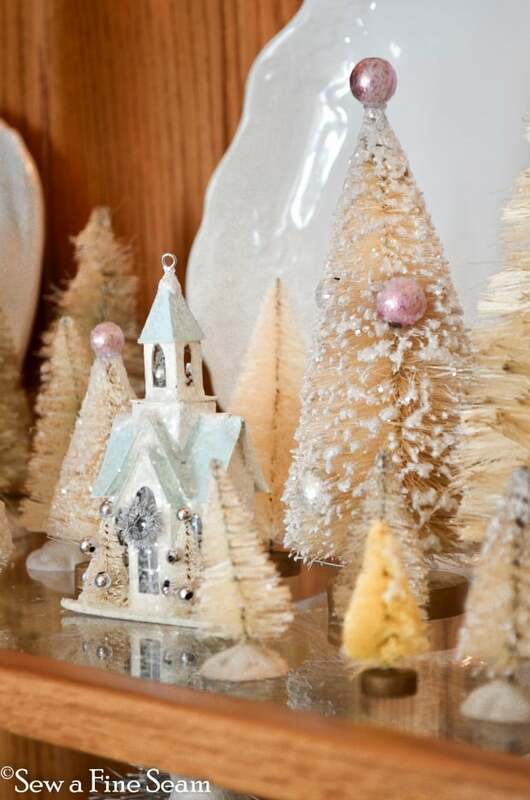 These little salt cellars made the perfect little holders for miniature ornaments. With the silver trees as a backdrop they look fun and festive. 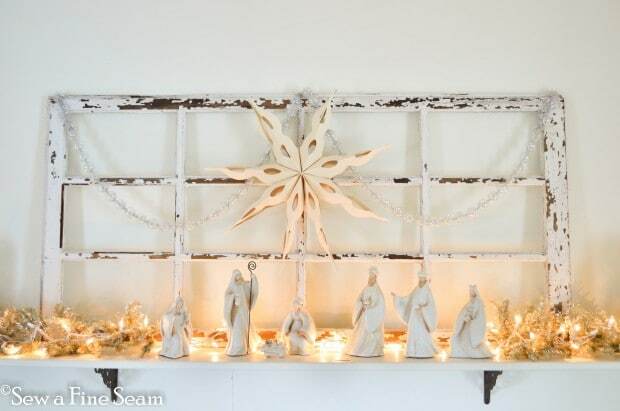 An all white nativity fits in well with all the bottle brush trees that have been bleached white. 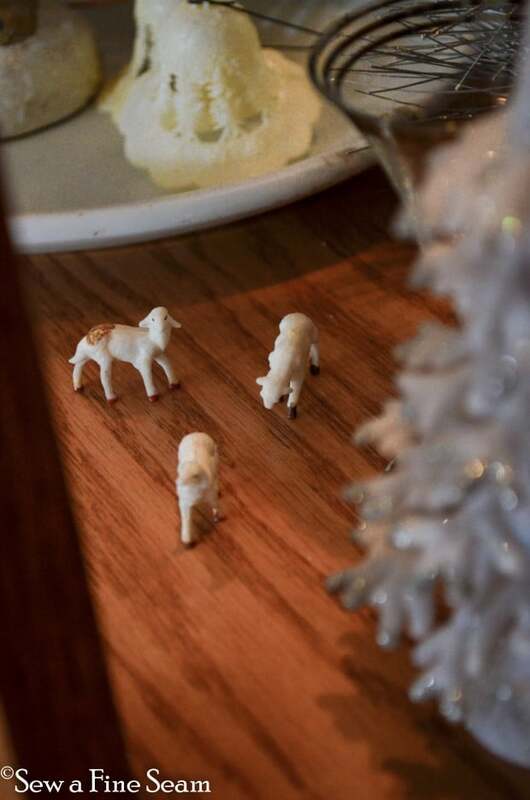 I’ve had these tiny sheep for years too My lightbulb got some ornaments added to make it look festive. 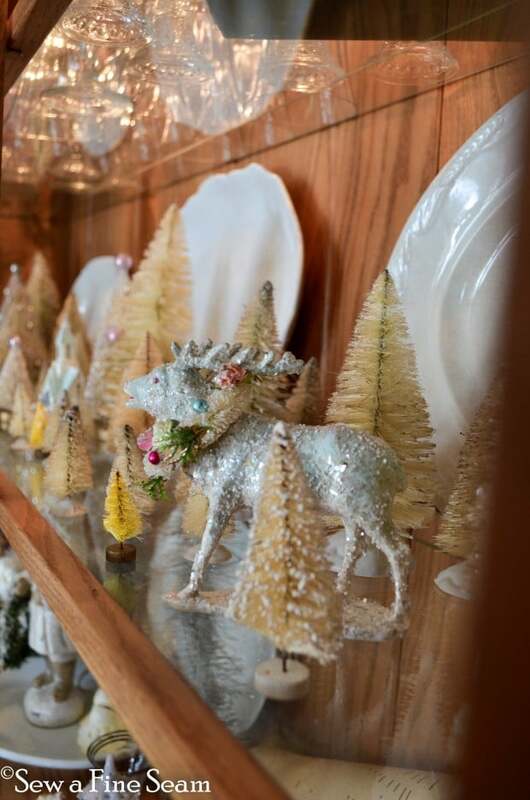 Ironstone platters, silver trees, a white elf and vintage bells create this vignette. My shelf in my living room can be quite a challenge to fill up and make it look like I want it to. I left the large window in the center and added a nativity set, lights, glass and tinsel garland and a white snow flake from Target. 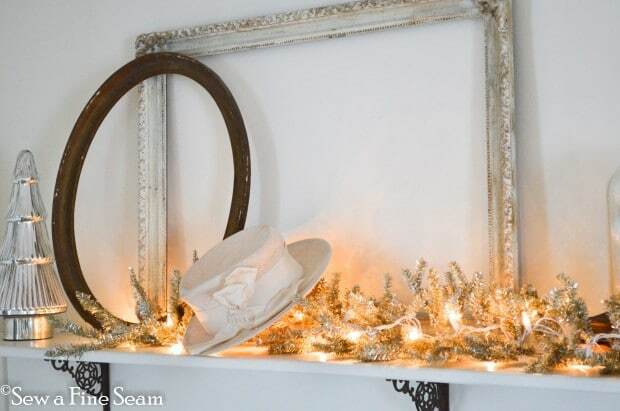 The silver tinsel garland is a new find this year. 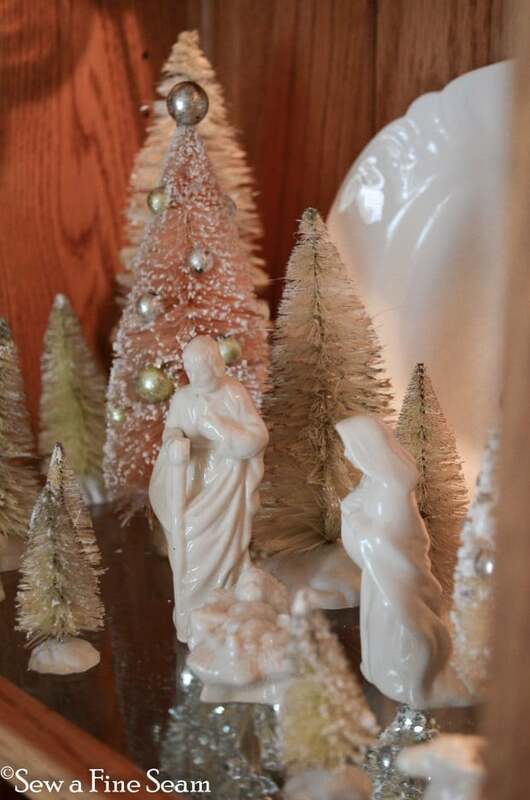 To the right of the nativity set is my Grandma’s brandy snuffer filled with vintage white ornaments. 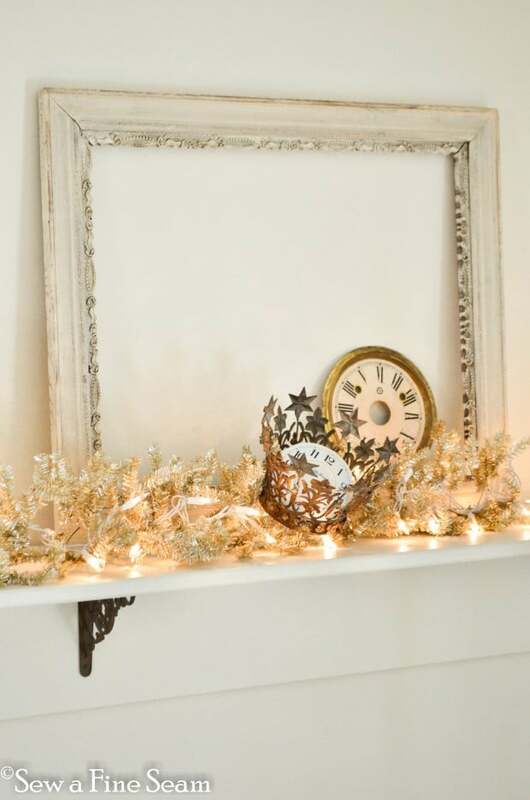 And beside that is a vintage frame with my favorite crown and a couple old clock faces. 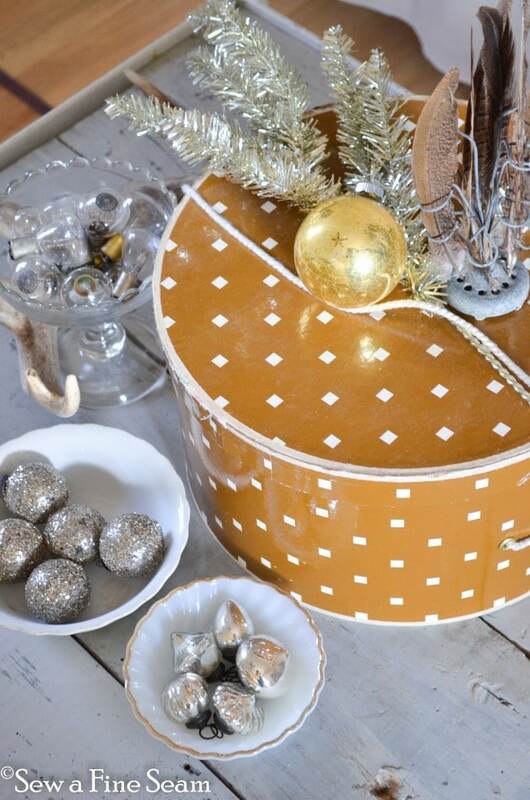 On my vintage restaurant cart another cloche holds vintage silver and gold ornaments. Above my handsome deer is all blinged out for the holidays! On my coffee table is the lovely hat box that the hat on my shelf came in. 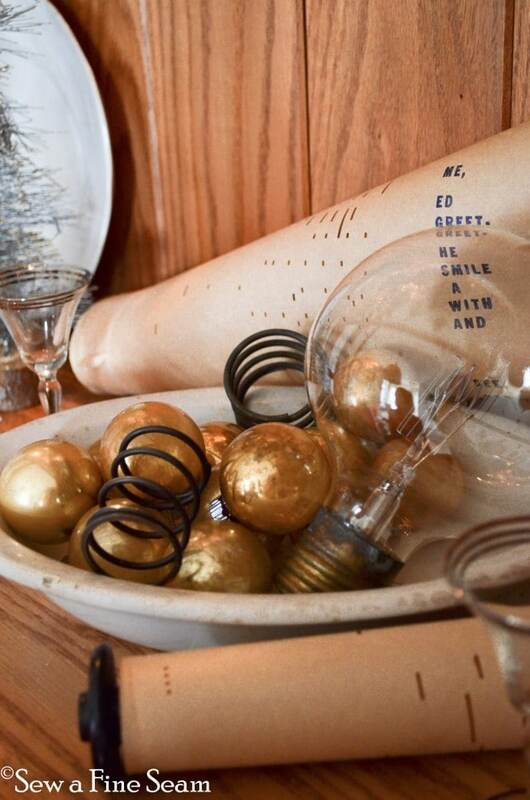 A silver pick and a vintage gold ornament and a few vintage bowls filled with ornaments and small vintage light bulbs and a deer antler create this vignette. 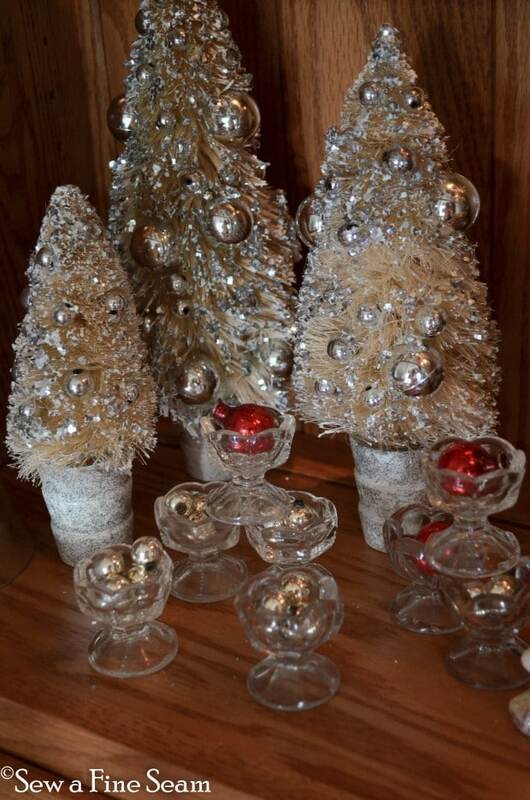 Small vintage ornaments scattered under a silver tinsel tree. My daughter thinks it looks like the ornaments fell off the tree. I just like the look. This table is just inside our front door in the dining room. On the other side of our front door – the tall nutcracker was an after-Christmas-find in Kansas last year. 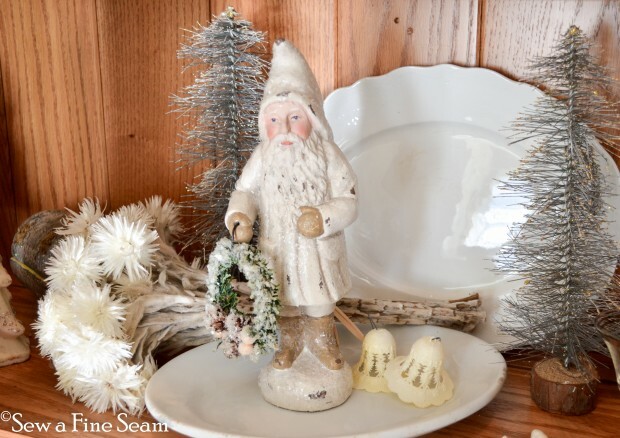 I painted him white and covered him with vintage glass glitter. More photos including what he looked like before coming next week. These old hangers I recently bought on our trip to Wisconsin. I love the way they look hanging here detailed with some boxwood, ribbon and a metal tag. And that’s all for now! I decorated a friends house last Friday and I go do another one today. 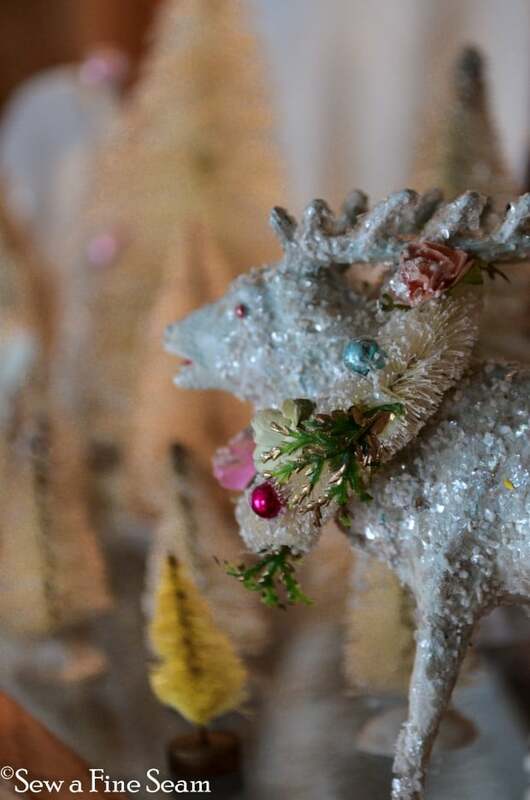 Will share pics and some tips on Christmas decor soon. Everything looks pretty! 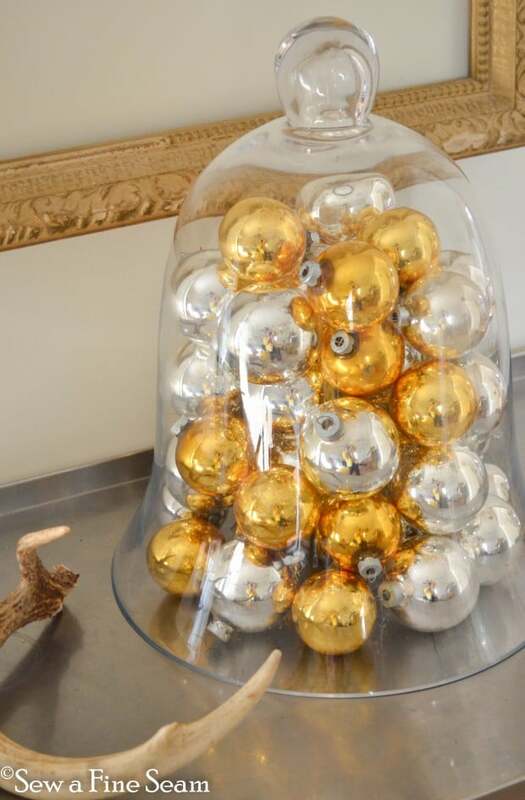 OK, I need to know HOW you got the ornaments in the cloche! Jill I could very easily and happily celebrate Christmas in your home. Love this post! Who would have thought to bleach the bottle trees? Love it! Your deer is completely adorable by the way! 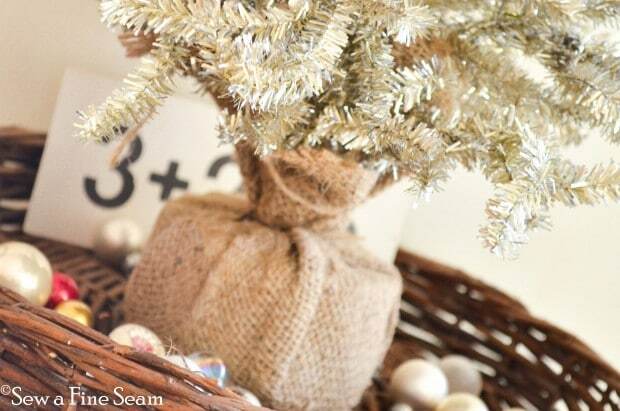 Wow, Jill ~ your amazing decor and ideas are endless!! I lost track of my favorites there are so many – gorgeous job, my friend! 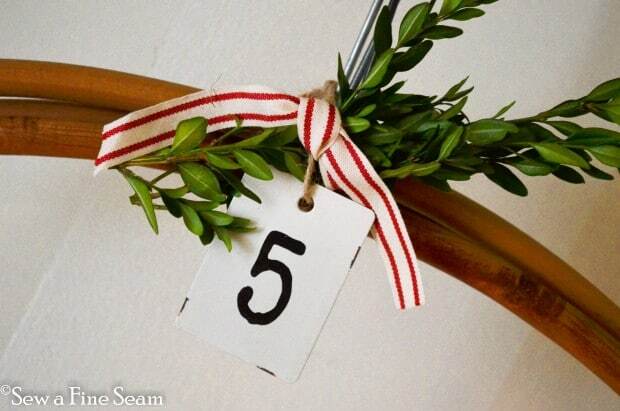 Your decorations are beautiful! Love the trees and the great way you decorated the hanger! Your decorations always make my heart skip a beat. I am smitten with bottle brushes…totally and completely. Love the moose. Love each thoughtful detail you included. Your house looks warm, inviting and magical. 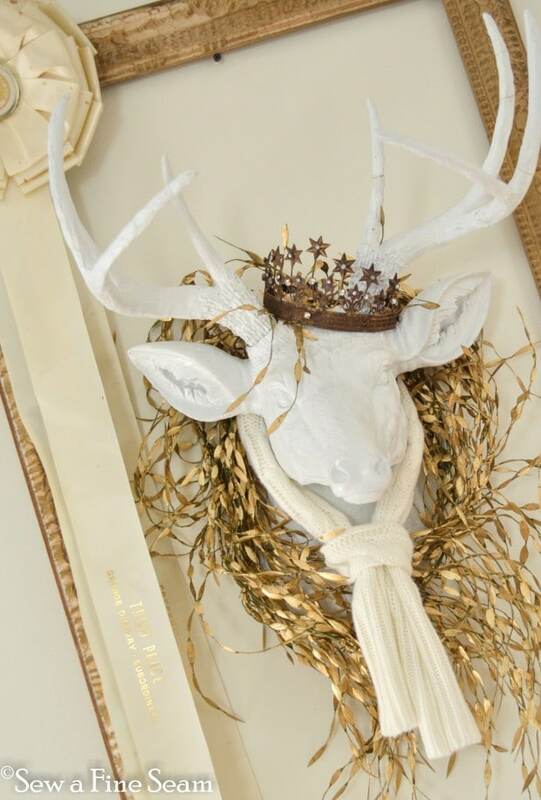 I love it all, Jill, but that deer with the scarf and crown would have to be my favorite!! Your home and decorations are really lovely! You know I am a fan of white, and you’ve really inspired me. I love the bleached bottle brush trees – what a great idea. 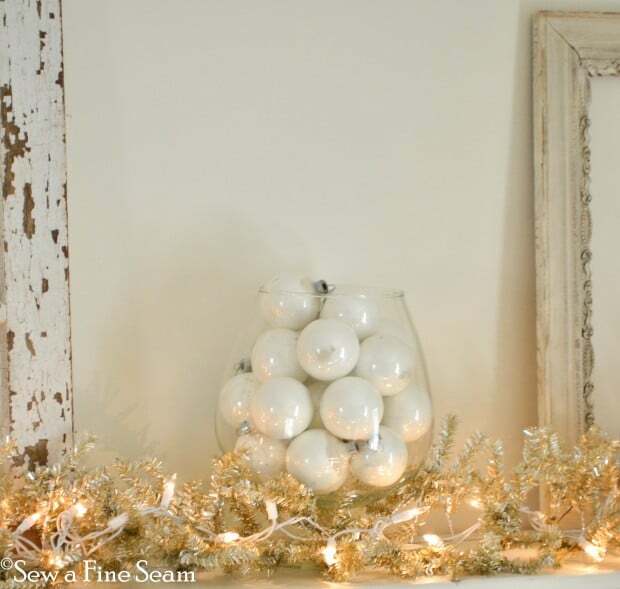 And the shelf in your living room looks so festive and ethereal. Thanks for keeping it light and bright! 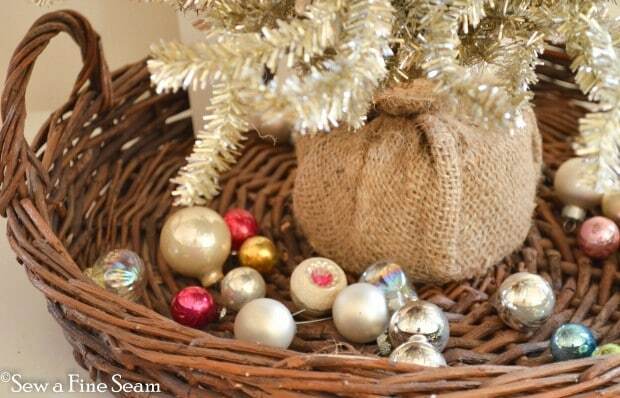 Your home looks lovely decorated for the holidays. Thanks for the tour and Merry Christmas! Little scream!! I love that hat. LOVE!!!! It really wants to come live with my hatboxes!!! I think your moose does like his forest home. He looks awesome there. And I like the 3 + 2 = 5 flashcard. Perfect. And the hangers look awesome! So pretty, Jill. I just adore your little moose! I couldn’t quit looking at him!! Your home looks so pretty all ready for Christmas. Love all of your bottle brush trees. 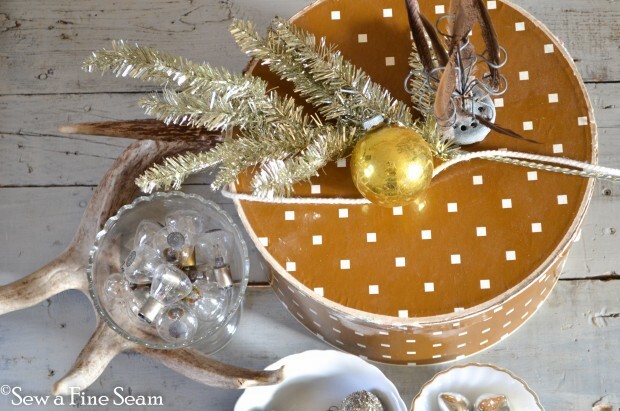 And the hat box on your coffee table is so charming. This tour has been such a treat, your home is just lovely! I am also thankful for the pin opportunities!! Gorgeous. And your photography is perfection! Thanks for joining our Twirl and Take a Bow Party! Hope to see you again next week!